What do the Apple AirPods, Bragi, Jabra Elite and Bose SoundSport headphones have in common? They’re all what you would refer to as ‘true wireless’ earbuds, a subset of modern headphones. That term does seem a bit on the nose, but there’s no better way to describe this type of headphone. Why? Well, because they are truly wireless, eliminating any kind of physical tether that conventional headphones usually need in order to connect to a device. Instead, wireless headphones rely on an active Bluetooth connection, syncing up over-the-air with smartphones, media players and more. Because of this, they tend to be more expensive than conventional headphones, obviously, but when you consider the features they offer you immediately understand why they’re worth the investment. 2 What Can They Do? The term also portrays the idea that the wearer or user is given much more freedom, if not complete reign. This is because there is another form of wireless headphone, one which is bulkier and tends to be less attractive. Over-the-ear and over-the-head style headphones are also available in a wireless format. These are much bigger, but sometimes they can provide a little extra comfort. They are not easily concealable, however, like earbuds and they can take up quite a bit of room in a bag or purse. Wireless earbuds, on the other hand, slip inside the outer portion of the ear canal and look remarkably similar to a hearing aid. In fact, it’s possible that others would entirely miss the fact you’re wearing them — at least with some of the smaller models. Apple AirPods, on the other hand, have a portion that protrudes outside the “bud” making them much more visible, yet still less so than over-the-head pairs. Of course, they offer so much more than just being wire-free. 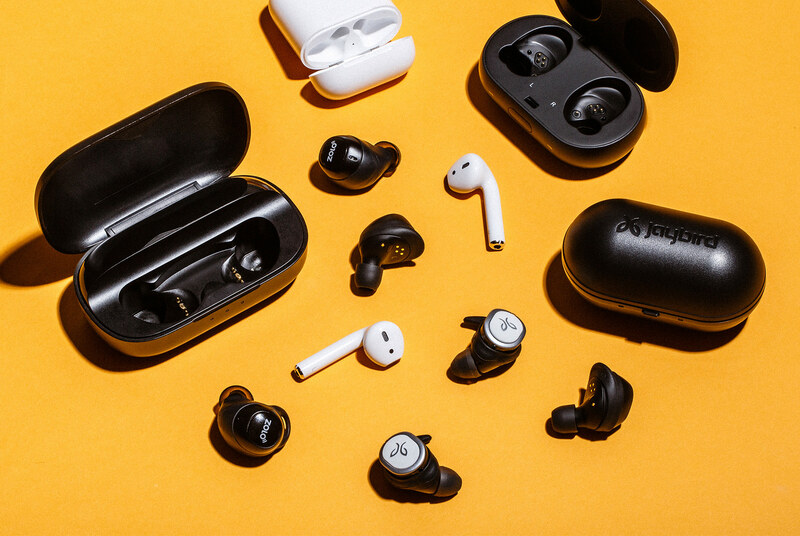 Almost all of the best true wireless earbuds include a carrying case that doubles as a charger or portable power pack. This serves a dual-purpose. For one, it makes the earbuds much more portable, but it also provides a little extra battery-life if you’re on a long trip and don’t have access to an outlet or USB port. Try taking an international flight without some form of personal entertainment, it’s horrible. Wireless earbuds with extra battery power make it so much more enjoyable. The Bragi headphones, Jabra Elite Sport, Samsung iconX and a few others include built-in fitness and activity coaches who provide suggestions and information about your habits. It’s akin to having a personal Alexa or Siri-like voice-assistant speaking to you, and only you. Others like the Sony Premium include noise-cancellation support to block out annoying ambient noise. Bragi’s pair includes an “audio transparency” feature that allows you to still hear the world around you, keeping you safe while listening. Whatever the case, there’s sure to be something out there for everyone be it the most-dedicated of audiophiles, or the most laid-back of casual listeners. You don’t have to spend an arm and a leg either. Many of the options are affordable, and prices range from about $100 up to $300 for the most expensive earbuds. Of course, there are plenty of exceptions too.